There are many things that make our village special and they come in many guises – our own brewery, no less than three great pubs, a well-stocked, community-run village shop and a mysterious link to John Le Carre’s spy school (more of this in another blog!) to name a few. 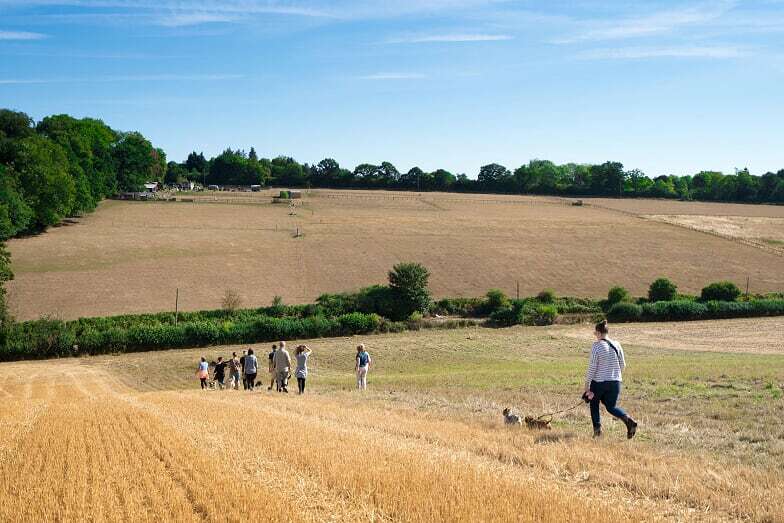 But perhaps one of our finest assets is the countryside that surrounds us and the walks that Sarratt villagers and dogs can and do enjoy on a daily basis. 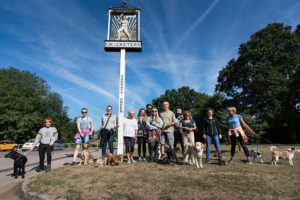 Each month, on the first Saturday, The Cricketers Pub sponsors an organised 2-hour dog walk. Fuelled by a Bacon sandwich and a cup of coffee or tea (provided by courtesy of the Pub) some 20 or more people and as many dogs of all shapes and sizes head off on a mapped route (each participant gets a copy) looping out through any of the beautiful and varied walks that can be found in the area: the Chess Valley, Commonwood, Chandler’s Cross, Chenies, Micklefield Green and more. Attendance varies often according to the weather but to seasoned walkers and hardy canines there is a guarantee of fabulous views across open fields and stunning woodland, bursting with bluebells in Spring and strewn with golden leaves in autumn. Rewards lie in the form of a pint of locally brewed “Win-Win” when your weary legs find rest again at the Pub. Forthcoming walking dates are announced on the Cricketer’s Pub Blackboard and on Facebook (search for “Sarratt Walkers”) where new members are all welcome. Dig out those walking shoes, grab the dog lead (don’t forget to bring a Poo-Bag!) and chase Rover over the Cricks.